Join us on Wednesday, April 12 at 7:30 p.m. in 103 Golisano Hall on the Hartwick College campus for the April meeting of MUG ONE, the Macintosh User Group of Oneonta, NY. How do you want to be remembered by future generations? A will takes care of your physical possessions, but what about your digital life—photos, email, files, and the like? 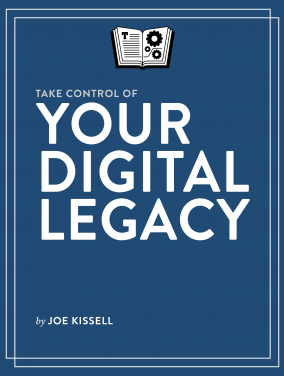 Joe Kissell, author of the ebook Take Control of Your Digital Legacy, will join us via Skype to give advice and answer questions on the best ways to safeguard and pass along your digital legacy, and on assisting loved ones with this crucial task. To help you put what you learn at the meeting into practice, copies of Take Control of Your Digital Legacy will be available at a special discount. This entry was posted by elsat on April 8, 2017 at 3:18 pm, and is filled under Meetings. Follow any responses to this post through RSS 2.0. Both comments and pings are currently closed.